Organizations have already started to adopt cloud computing for a few years now, and it will continue to influence the enterprise IT strategies and solutions in 2017. Implementing cloud technology for your business gives you a competitive advantage and potential opportunities for business innovation in terms of agility, speed and cost savings. For most enterprises, it is no longer a question of whether it is appropriate to opt for the cloud, but when the right time is and what services should be moved into the cloud. 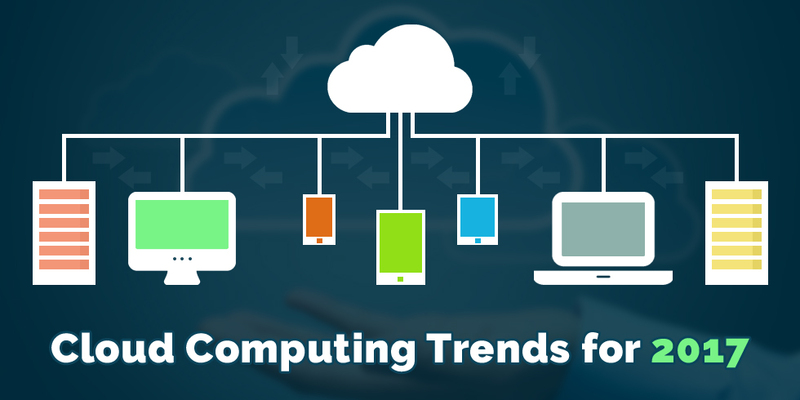 Let us look at the top trends in Cloud Computing as 2017 approaches. Cloud solution providers are constantly updating and developing their services and offerings and hence it is necessary that the users of cloud stay updated to get the best value and optimum service out of their cloud provider. Many companies are taking up on cloud infrastructure to meet their expanding business requirements and strategies. If your enterprise has adopted a cloud solution, then you need to keep a constant check on the changing trends in the technology. Cloud Computing has become a standard way to run business apps. More than 70% of companies today have cloud-run apps for various purposes of their business, and it is predicted that by 2020, 90% of organizations will have cloud-run apps. 2017 will see the expansion of cloud computing in enterprises and a wider range of apps will be adopted and used in the cloud. It is predicted that by the end of next year, most companies will have their apps and platforms on cloud systems. For enterprises, both public, as well as private-based options, provide better flexibility and agility regarding information sharing. The cloud strategy will continue to increase in popularity and enterprises need a hybrid-cloud approach to solving issues in organizations. Hybrid cloud will be a key trend in 2017. To make the hybrid strategy work, companies need to have an audit function that would make sure all the services are provided as per the purpose by the cloud provider. For managing the hybrid strategy, cloud service brokers are introduced who will define the services and then manage and secure them. A survey shows that at present, an average company runs about 45% of all its business operations on a cloud platform, which includes private, public as well as hybrid clouds. Companies have started using multiple cloud models to meet their differing IT and business needs. An IDG survey shows that currently, about 62% companies use the private cloud, 60% use public cloud and about 26% use a hybrid cloud architecture for their business. The concept of hyperconvergence is expected to be a hype in 2017. These systems are useful building blocks for a cloud infrastructure, but there is a big gap between what they offer and what enterprises need from a cloud system. Hyperconverged systems just provide 20% of the integration, and the rest has to be done by the company themselves. The system right now just provides support to virtualization and the complete solutions are still away. Moving an enterprise data to the cloud does not negate the need for a security system. The cloud service provider needs to provide appropriate levels of relevant information security. The shift in cloud technology will be massive and hence it will call for developing heightened security in 2017. More and more IT teams and developers will be working on ensuring better security of the cloud system. According to IDG’s survey, the trend of investing in the cloud will see an upward shift in 2017 with US companies planning to spend an average of 1.77 million dollars on the cloud. More companies are going to use it, and those who already use it will rely more on it. If you wish to move your business processes into the cloud and are looking for an experienced cloud computing service provider, then Semaphore Software would be an ideal pick.